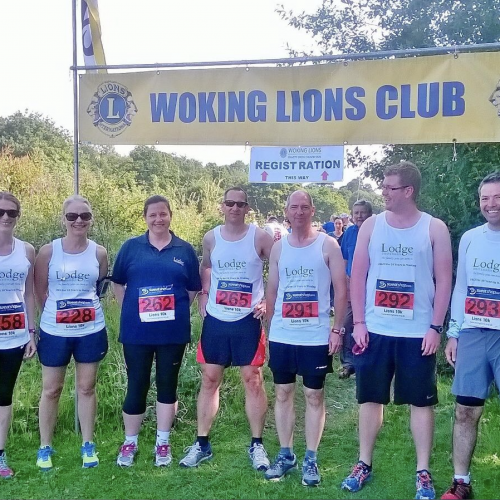 ‘Team Lodge’ made up of seven members representing Lodge Brothers, participated in the Woking Lions Charity Run on Sunday, 18th June 2017. Funds totalling nearly £600 have been raised to date for the York Road Project ‘defeating homelessness in Woking’, Woking District Scouts and Lions Community Work. Pictured at the start from left to right are Claire Stanners, Susan Areington, Susanne O’Connell, Chris Lodge, Andrew Lodge, Adam Trousdale and Steve Handley.